Convectron's compact reactor concept uses internal charge and electric fields where bulky Tokamak schemes need external currents and magnetic fields. Without vacuum pumps and superconducting magnets, bosonic vortex cores will confine dense fusion plasma. Two Convectron patents fit the reactor vessel with flow nozzles for fireball position and fuel mixing units for output control. Battery-powered ignition demands mobile electrodes while high-voltage breakdown methods admit fixed electrodes for ignition. 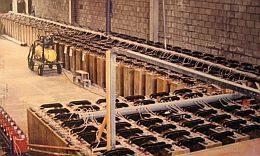 In the mid-1980's Convectron's predecessor installs submarine propulsion batteries as shown in the photo on the left. Short-circuit tests at peak power record fireball generation on high-speed film. National and worldwide TV audiences see this fireball in two documentary films. 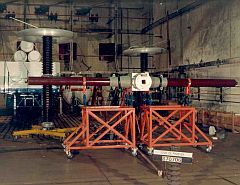 The photo below shows a Laval nozzle for high-voltage tests in gas flow at the KEMA High Power Laboratory in 1986-87. Breakdown tests at peak power stop before Convectron demonstrates fusion conclusively. A Japanese initiative documents circuit design and performance as neutron source in book form. 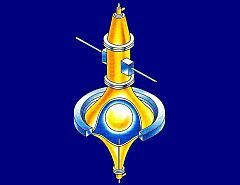 A series of publications details fireball fusion concepts in leading journals and conference books. With quaternion modes for central fireball potentials as published in a recent paper, which is posted since April 2010 on the PIERS open access web site (link). In 1995 a TV spectator informs Convectron privately about fireballs from early laser tests. Their start pulse launches fireballs erosion-free from a open induction coil. As photonic process this method brings fireball fusion within reach of discharge power from the KEMA capacitor banks.